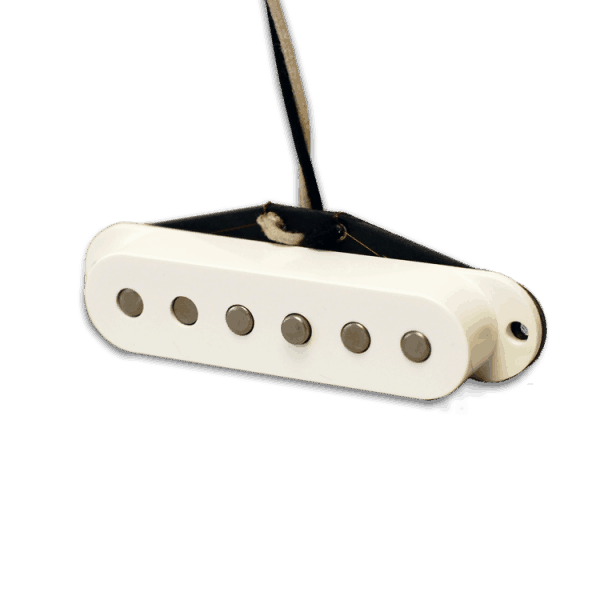 Fralin Twangmaster Guitar Pickups: Single Coil Tone, Humbucker Size. A humbucker in size and shape, The Twangmaster features open, airy and pure single coil tone. 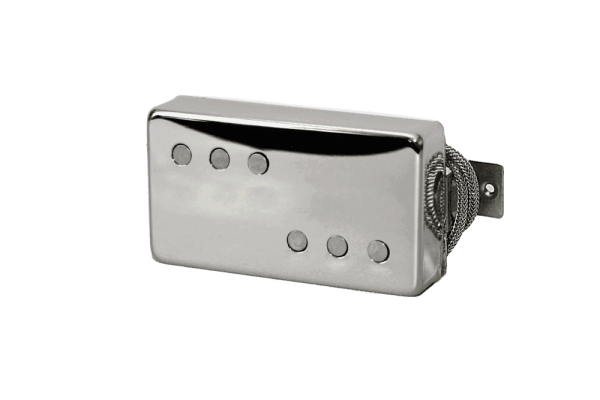 The Twangmaster is a clean, clear, articulate but very warm Single-Coil Sounding Humbucker. The Bridge is bright and snappy, while the Neck sounds like a Fender Strat Neck pickup. PURE SINGLE-COIL TONE IN A HUMBUCKER COVER. The Twangmaster is an electric guitar pickup perfect for anyone who wants a Single Coil tone in their humbucker-routed guitar, but hates hum. 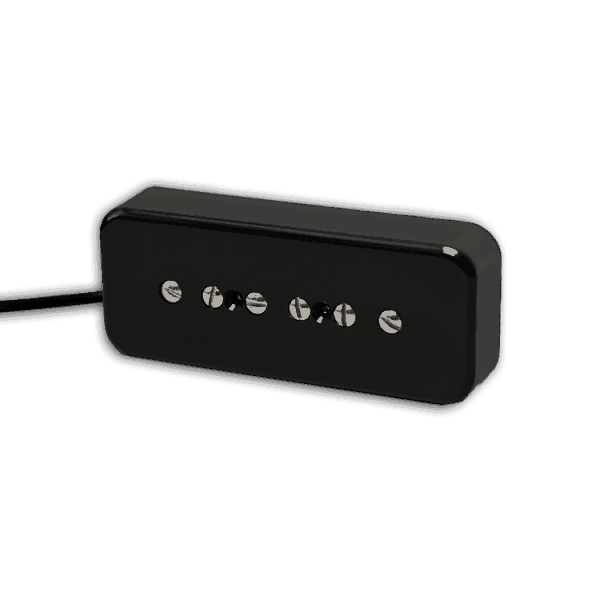 The Fralin Twangmaster is a Split-Single Humbucker-sized Hum-Cancelling guitar pickup. We use a Left-Right coil design to make sure that there’s no hum at all. Our Twangmaster® uses AlNiCo V magnets and sounds clean, bright, and smooth. This pickup is the clearest and cleanest humbucker we make – clearer than our Big Single, and cleaner than our Fralin P-92. Clean and bright, articulate and expressive. The Fralin Twangmaster is slow to break up, but you’ll find that it’s loud and dynamic. For those who love the sound of Single Coil pickups, now you can fit them into the humbucker routed guitar. Built with AlNicCo V magnets, we use 42-gauge or 43 gauge wire depending on the strength you need. The Twangmaster has no hum, and gives you a traditional Fender tone. Expect a clean, snappy tone when playing clean. With distortion, you’ll find that the grind is smoother than our P-92. Players who want a more aggressive tone should look at our P92’s, as our P-92’s sound more like a Gibson. Expect a more sparkly treble and a dynamic attack. Our manufacturing process allows us to achieve unparalleled quality control. Our Twangmasters consist of USA-Made bobbins, baseplates, magnets, and wire. We wind each pickup by hand, one at a time. Each pickup is wound using our proprietary “Sectioning” technique. This gives the pickup a sweet, clear tone.We assemble each pickup one at a time, by hand. 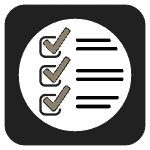 This allows us to achieve unbeatable attention to detail. Finally, we wax-pot the pickup to preserve the pickup, and prevent microphonics. Which Output do I choose? The 8,000 / 8,800 Turn Set will give you the approximate output of our Vintage Hot Guitar Pickups – Clear, Clean, Versatile. For More of an edge, choose our 8,400 / 9,400 Turn Set – this will approximate the tone of our Blues Special Guitar Pickups – Fatter, beefier, quicker to break up. 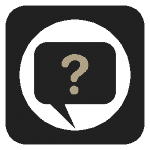 What’s the tonal difference between the Twangmaster and the P-92? The P-92 is a lot more aggressive, with a bigger midrange, and a harder and more stiff treble. What Pot do I use? 250K. Wound with 42 & 43 Gauge Single Poly Nylon Wire and Alnico 5 Slug Magnets. 250K Pots are recommended with this pickup. The best selling set is an 8,400 (~7K) in the neck and a 9,400 (~8K) bridge. I have an ASAT Bluesboy; I put a Steel Split Pole in the bridge position, a stock wound Twangmaster in the neck position, with a 300k volume pot and a blender pot instead of a tone control. My mind is blown; I can’t stop smiling when I play it. I put a Twangmaster in the neck position on my Aria pro (ES 335 copy) a while back. Phenomenal pickup! Bridge sound was good on the guitar, but despite trying several other pickups, it’s always been too dark sounding in the neck position. Twangmaster has a bright full tone, but not harsh at all – without 60 cycle hum of a single coil! This is now my #1 gigging guitar. Pickup is worth every penny. I installed neck and bridge Twangmasters in a Guild Bluesbird Guitar. I replaced with new 250k pots, 0.022uf caps and a treble bleed cap. I was wanting a single coil tone flavor from guitar, and I am very pleased with the outcome of the installation! The Neck has the sparkle/chime tone, and Bridge has that Tele bark and twang without the shrill highs. The neck and bridge together have a good single coil quack. I’m very pleased with the tone and output of these pickups! Highly recommended if you want a single coil tone from a humbucker. Dig it! Bright and beautiful. Thank you!!! The Twangmaster is the best pickup for me! Great sounding set of pickups. Tangy! Er, uh, I mean twangy. Seriously though they are exactly what my client asked for. Nice sounding single coil for a humbucker space. Awesome! You know they had more output than I had expected and sounded a little different than I had expected but I gotta say I didn’t know I wanted that until I had it! Great pickup! Awesome. Love the voice of these pickups and Fralin staff very helpful when I was picking them out. Thanks! Popped a set of the Twangmasters (7800 neck, 8600 bridge) into an Eastman AR-371CE-2, which is an ES-175 copy. Made previous pickups sound dull and lifeless by comparison, even though people were giving me all kinds of compliments on the tone BEFORE the mod. This was just a decent hollow-body guitar, and I am so glad that these pickups have now made it an irresistible guitar amongst the dozen or so that are in constant rotation. Truly amazing! Pure Sweetness: 8200 neck and 9000 bridge. I can assure you the tone is round, very wide range slinging single coil, breaks up the amp, very sweet not harsh. Do yourself a favor and get these if you want a single coil sound on your humbucker-sized guitar. Frankly, the Twangmaster is a giant sleeper pickup. Replaced with this in my Les Paul Jr. Admittedly an unusual choice for conventional thinking. Beware…work with several caps on your tone pot if you have a definitive sound palette in your ears. We settled on a .5 (.47) Orange drop that delivers a dynamic parametric feeling in this guitar’s tonal landscape. Now this Jr has a spot in my ‘always’ tour rig. I ordered one of these with 8,000 winds, because I was going for a really strat-like sound. It delivers exactly that at this wind level! Bright and snappy! It also has plenty of body and bass. I have played at my home with it for about 2 weeks now, and played 2 shows with 3 different amps, and it sounds very similar to my 62 RI strat with early 60’s winds. Again, a little more body and bass, but PLENTY of top end to cut through a band mix with heavy bass and keys. * Reviewed for 8,000 winds. Killer sounding pickup, completely true to the description above. Sounds exactly like a neck pickup of a strat but with output that easily matches my Gibson bridge pickups and zero noise. It has a great balance across the strings and it basically saved my HH strat that I just couldn’t get to sound right in the neck position no matter which pickup I would try. Lindy Fralin makes incredible stuff and their customer support is GREAT. Now I gotta save some money and buy a bridge pickup from Lindy as well. It only makes sense! I bought a Twangmaster neck for my Fender Telecaster, it use to have a SD Jazz but I wanted something with more definition and suitable for 250K pots (I can’t take 500K pots on tele bridge pickups). AWESOME= pure tone + great hi fi for wound strings + warmth for treble strings. Anything that Lindy Fralin touches translates into pure ballsy sound and this pickup is no exception. Outstanding option for Clean AND distorted tones in warm music as jazz, blues, funk and classic rock. Hum? NO! Tone? Yes! If that sounds about right to you, go for it. I bought a Twangmaster for the neck pickup of my ’84 Tokai flying V. I was going for a big ‘strat’ like neck tone and boy was this the right choice! I actually chose the 9,400 turns more common of the bridge position, and it sounds great. It has a beautiful big clean tone and with some grit it’s perfect for the ‘texas’ boogie. 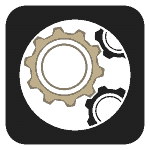 Its also dead silent with zero hum, highly recommended! I need another!